Dr. Harold Popp holds degrees from Ottawa University, Indiana University and a Ph.D. from the University of Iowa. He has spent a lifetime involved in the world of the arts as an educator, administrator, composer, conductor, trombonist, author, and editor. He is currently adjunct lecturer in music in general studies at the Indiana University Jacobs School of Music. As a professional trombonist, he has performed with the Kansas City Philharmonic, Opera and Ballet, South Dakota Symphony, New England Symphony and Brass Quintet and the Tallahassee Symphony. He has also recorded an compact disc of his own chamber music for trombone: Pieces from the Wood Box (Coyote Records). The Divertimento is included on that CD. Concert Trio for tenor trombone, bass trombone and percussion; Metagenthysis for five trombones; Pieces from the Woodbox for tenor trombone and percussion; Quintalogue & Dance for tenor trombone and percussion quartet; Three Psalms for tenor trombone and choir; Turn Not Thy Face for trombone and keyboard; Discourse on a Square for solo bass trombone; Hymns for Solo Trombone & Wind Ensemble. The term divertimento for a musical composition dates most likely from the 18th century when many such works were penned. They were generally intended for small ensembles, meant to be lighthearted in tone, often as background for a social occasion. 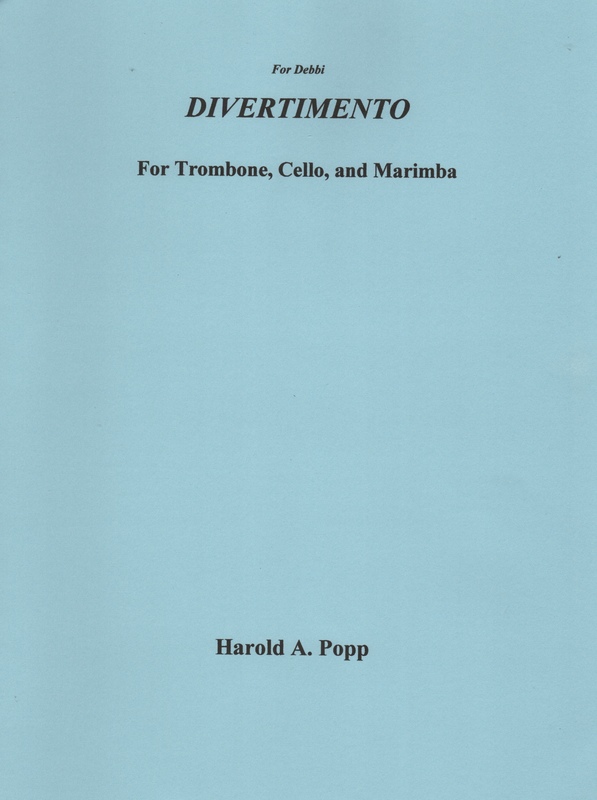 While an ensemble of trombone, ‘cello and marimba would not have been found in the 18th century, there is a certain aspect about this divertimento that would qualify it for the term. It was not a commissioned work but written for the composer’s daughter, who is a professional cellist, so they could make music together. It is divided into four separate movements: Declamation, Images, Song and Dance. The three instruments are treated as equals in regards to the musical material. The timbre combinations, while unusual, work quite well and create interesting colors. The music is expertly constructed using traditional forms of motivic and formal unification. The rhythmic vocabulary is fairly traditional, as is the harmonic language. The latter includes tonal centers instead of functional relationships, traditional key signatures, modes and some extensive chromaticism. Technical demands are within a good college level ensemble. Layout and printing are first class.